Predictive Maintenance - EFPS - European Food Processing Systems Ltd.
Our predictive maintenance tools will improve the safety, reliability and efficiency of your equipment and plant, and help to extend machine lifetime and improve overall output. 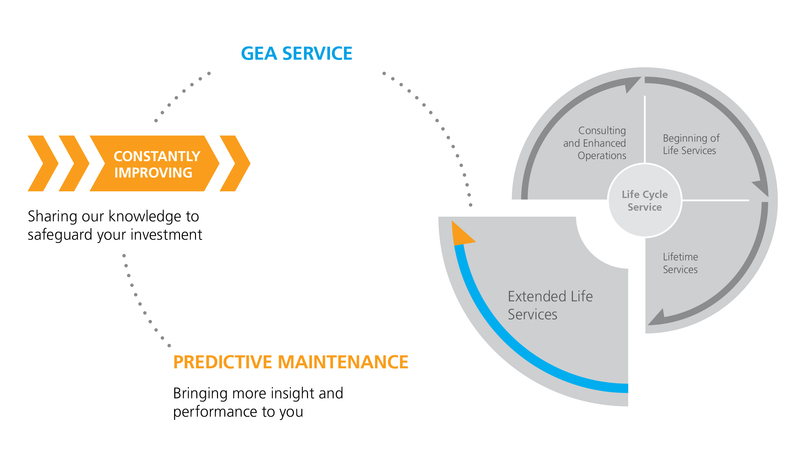 Predictive maintenance from GEA monitors the operation and performance of defined equipment in your plant. Combining this information with the experience of the GEA technicians, allows you to optimize your maintenance activities and related costs. 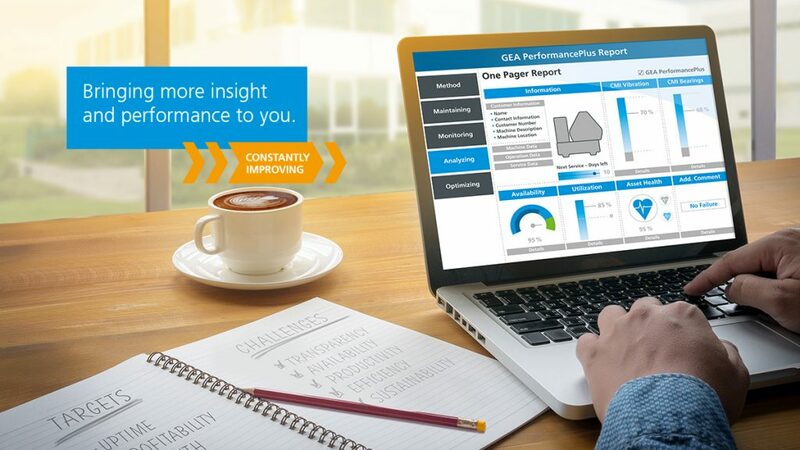 With our GEA PerformancePlus (available for selected products) we can support you in developing a reliability-centered maintenance program (RCM program). This will help you identify the optimum levels of maintenance for your equipment and plant. GEA PerformancePlus visualizes a clear health check of each machine. It uses data analytics and simulation models to build up a digital map of your plant allowing you to pick out the abnormal from the normal and take action when it is required. Limiting intervention in this way, minimizes maintenance costs and down time, while ensuring that the plant runs at optimum output at all times. GEA PerformancePlus creates transparency about the current health status of the equipment, increases its availability, ensures optimum productivity, brings efficiency optimization potential to light and enables a sustainable equipment utilization. GEA PerformancePlus offers customers service level options that extend way beyond routine preventive maintenance and complement customer Industry 4.0 strategic efforts. 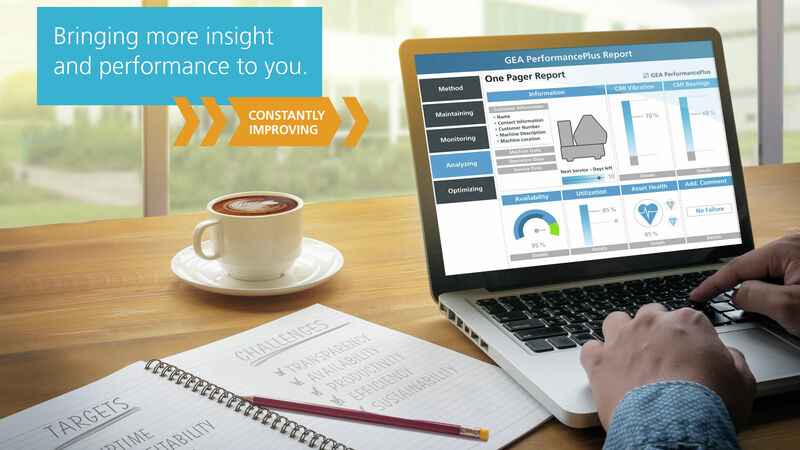 Transparency – Deliver facts about the current health status of the equipment – to constantly improve decision making. Availability – Assure the equipment is always in a good condition and ready for production – in turn helping customers to increase their equipment uptime. Productivity – Establish processes that ensure a reliable and flexible production environment – to ensure a total and optimum utilization of the Assets. Efficiency – Secure, enhance and optimize the operational performance during the Lifetime – to minimize losses and achieve higher profitability. Sustainability – Assistance, advice and expertise on the latest developments and technologies – Enabling our customers to be competitive and sustainable partners for their customers. Monitoring, Analyzing and Optimizing – Condition monitoring and analysis technologies mean that we and our customers can keep track of how equipment and systems are operating, and configure and optimize equipment, customer processes as well as their output to meet changing needs. Cost control – At GEA we build value into providing the best service and support options for all our customers in line with their Performance demands.